ASAP Utilities is a powerful Excel add-in. The tools from ASAP Utilities add new functionality to Excel and are guaranteed to save you time and speed up your work. Since 1999 it has grown to become probably one of the world's most popular addition for MS Excel. 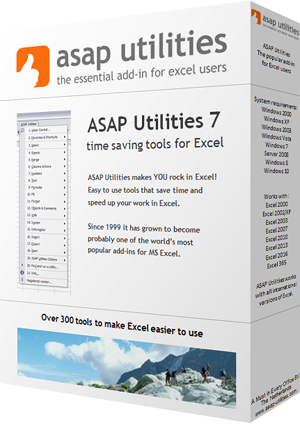 ASAP Utilities is the product of many time-saving features and additions for Excel. The extensive features are the result of years of experience and development, combined with the feedback from many respected users at different levels of experience. Particularly the feedback from users has been very important, and will continue to be important in further development. ASAP Utilities is called this way because it significantly reduces time-consuming work. ASAP is an acronym that stands for "As Soon As Possible" (definition). Some choose to spell it out, others tend to pronounce it "aysap". The word utilities means something useful (definition). 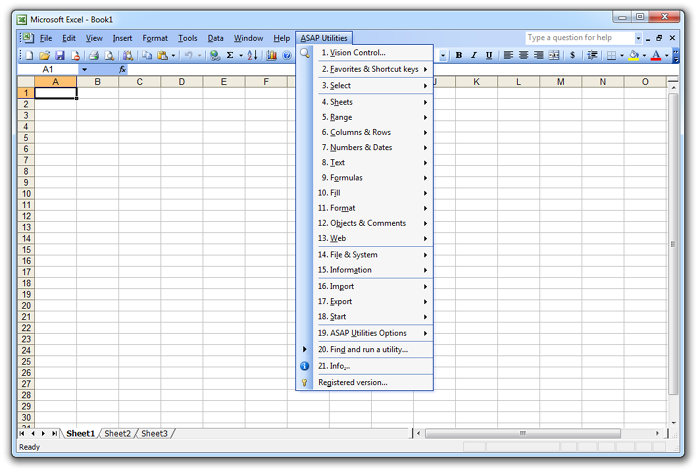 Combined together ASAP Utilities stands for useful time-saving macro tools for Excel. Most people struggle with managers, bosses or clients that tend to ask for you to get the job done yesterday, which of course is often difficult to pull off. ASAP Utilities doesn't allow you to travel back in time but it can certainly help you to speed up your work in Excel. Since its first release in 1999, ASAP Utilities has been improved and extended with many new features and a friendly interface. It is under constant development, so new features and improvements are being added all the time. The first year I put the program on the internet, nearly every month a new version was released. Nowadays a new version is released at least twice a year. The input we get from users all over the world is a great stimulation for us to make it a better product every time. We've made it easy to see how many hours you saved with ASAP Utilities. You can use this report for example to calculate the Return on Investment or show it when you need to ask someone to approve the purchase. By offering a free version of ASAP Utilities (already since 1999) we want to contribute to society. The free "Home&Student" edition of ASAP Utilities is free to use for home projects, schoolwork and charitable/non-profit organizations such as for example MSF and Amnesty International. Especially with providing it for free to students and charitable organizations, we hope to contribute to a brighter future. In my humble opinion I believe ASAP Utilities is a must in every office. I use it myself on a daily basis, and it saves me an incredible amount of time. On our website we have listed some reviews from independent magazines and websites about ASAP Utilities. I am proud to mention that ASAP Utilities is used worldwide in over 170 different countries by 750,000+ users and purchased by 20,000+ organizations.